This SpringerBrief equips readers to develop defensible fire safety designs for a range of concrete structures. 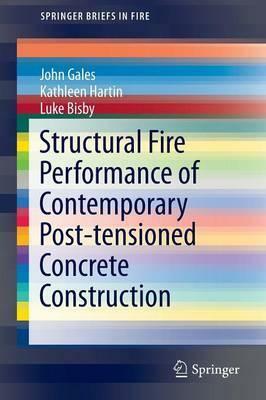 It identifies current gaps in the research and provides a more complete understanding of the structural and thermal response of contemporary Post-tensioned (PT) concrete structures to fire. The brief includes chapters on contemporary construction using PT concrete, previous structural fire test research programs, recent research programs, real fire case studies, and current research needs. It explores the progression of PT concrete structures, looking at the sustainability and aesthetic benefits, the ongoing development of stronger concretes, and best practice guidance for improving safety in the event of fire. Designed for practitioners and researchers in fire engineering, this brief is a valuable tool for those studying the impact of fire on concrete, fire safety designs, and building safety optimization. Advanced-level students in civil engineering will also find the content useful.